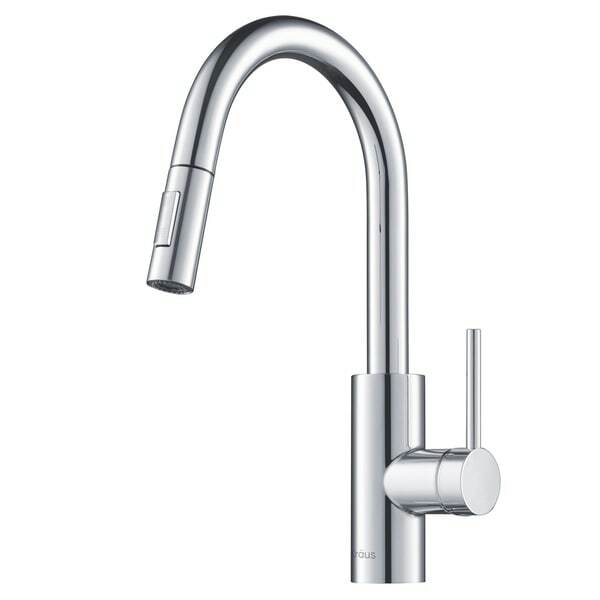 Great sleek tap, easy to install, and the spray head pull down is ideal for washing the sink! Dimensions 8.75 In. X 2.5 In. X 15.75 In. This kitchen faucet by Kraus is perfect! 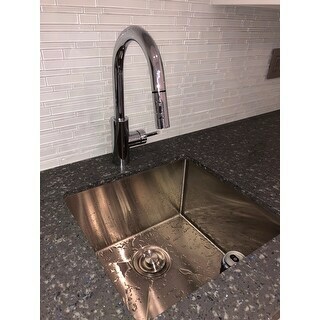 A modern sleek chrome look to go with the Kraus sink that I also had installed. The water pressure is great, the lever is smooth and quick to respond to desired water temperature, no issues with the hose retracting (though I've only used it a handfull of times so far). Some reviewers complained about having to hold the button down for the spray function but it doesn't bother me. I'm not sure how easy installation was since my contractor took care of it. The neck swings from side to side and there is also an optional cover plate for the base. Great buy. 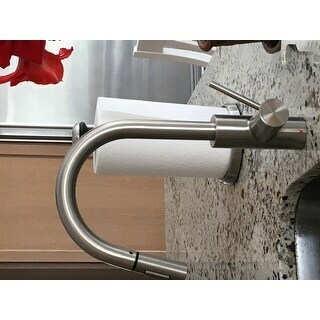 This Kraus KPF-2620 Oletto 1 Handle 2 Function Pull Down Kitchen Faucet is for the kitchen island sink (renovated 2007.) It is the smaller of the two sinks in the kitchen but gets a lot of use. (For the larger "Main" sink, I purchased the Kraus KPF-2631 Oletto 1-Handle 2-Function Sprayhead Commercial Pull Down Kitchen Faucet.) Originally, I had chosen two of the larger (latter) faucets but the Island sink needed a smaller faucet. Overstock was great and quick with facilitating the return and refund when I sent back the larger faucet. My kitchen needed a little bump up design-wise. These new faucets are a simple and affordable way to make the kitchen look brand new! They are both well built and study. I love the pull out hose and the two functions - regular and spray. While they are not exactly the same, the design is visually similar and complimentary. Highly recommend. I am a real Overstock paying customer. I have used Overstock for many years to furnish my home. I purchase school supplies, art supplies, craft supplies, furniture, appliances, bedding, dishes on and on and on. Overstock has fast shipping, low, competitive prices and always a great selection. I'm so glad I bought this faucet! The retractable hose comes out pretty far and the water connection hoses are made of braided stainless steel(pardon me if I'm using the wrong terminology). 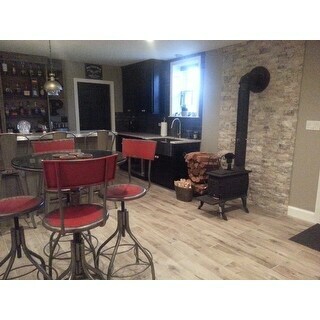 It looks amazing with my white marble countertop and 33" black undermount sink. Even the packaging is very stylish. The base plate is also in chrome finish. It's only a third of the cost of the Delta Touch2O pull down faucet I bought but much better made. 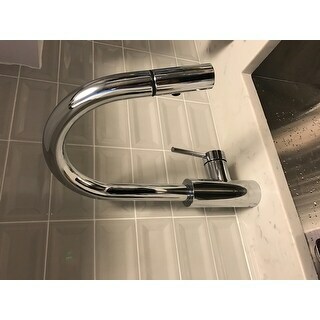 If you want a simple pull down faucet with super high end look and top notch quality then definitely go with this one! This faucet is really great! It has a very stylish modern design with a heavy duty feel. It has the same appearance and feel as many of the other higher end faucets that cost so much more. The stainless steel finish is very good for hiding water spots that are easily seen on chrome models. I would strongly recommend and a nice plus is that It comes with a mounting plate to cover any additional holes that your sink might have. Another great feature on this faucet is the weight that helps pull the sprayer back into the neck. It is very large & heavy. It has enough weight to pull the sprayer back into place without effort. Would highly recommend! This faucet shipped and I received it within a week of ordering. It was very nicely packaged and is great looking. The water pressure from the faucet is better than our last faucet. Only downfall is that the sprayer doesn't stay on unless you are pushing on the button. Perfect for my basement kitchen clean simple lines, excellent. Has optional pull out sprayer or touch to spray on the handle, can adjust handle to either side. Looks super clean and classic design. This faucet was the perfect fit for our new kitchen. It's simple and elegant, and VERY good quality. We chose a very large under mount sink, and this faucet installed perfectly in the tight space that was left. The hose pulls down effortlessly, and clicks back into place just as easily. The water pressure is awesome. My husband has installed many faucets, and said that this is the easiest faucet he's ever installed. Nothing negative to say about this purchase. Super sleek and superior quality! I am very pleasantly suprprised as to the quality of this faucet! It is super sleek and spiffy and makes our new stainless steel kitchen sink look much better. We git the brushed nikel finish. Looks really handsome. Installation was a breeze. I actualky had purchased a similar looking German made faucet from *** for *** but returned it and purchased this, as it was love at first sight! The songle lever is very sensitive and responsive to the touch to easily control flow and temperature and pull-down sprayer is very smooth. Also, the 180 degree swivel works well to enable the utilization of multiple basins if you have a large sink. I am happy with this purchase Nd strongly recommend this fixture. It's hard when buying online but I love this faucet better than any other faucet that I've seen at the local stores. Very smooth, nice length for the spray, and great feeling with the handle. The modern look is perfect for our contemporary kitchen. I love this faucet! I spent a lot of time looking for a pull down kitchen faucet that didn't have a bulbous end AND didn't cost over $*** AND was of good quality. Kraus is an excellent brand and I really like this faucet a lot. Everything feels elegant and substantial when I use it. The end pulls down and the button allows the flow to switch to a spray. The button can be turned to the back so you don't see it. And the faucet swings back and forth for maximum coverage of your sink area. I would buy this again. I've had it for 4 months so far and it works great and looks amazing. We needed to attach the counter-weight quite high on the supply tube to stop the sprayer from 'twitching' when turning on/off the water. I was looking for a faucet that pulled out but didn't have the bulb on the end. This is perfect. I bought this faucet and be matching sink. The modern look of this faucet is perfect for a minimalist look in an kitchen. Looks very expensive. This has a clean and sleek look. I decided to install it without the bottom base piece and it looks great. This faucet looks great. The chrome looks very high end. It was essy to install. 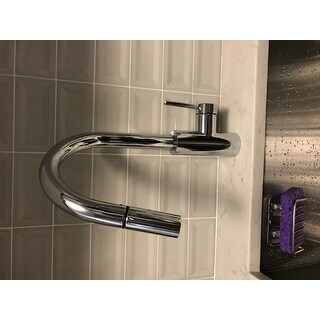 This faucet seems quality construction and works well, while nicely matching the chrome Insta hot we bought! Great look and functionality. Easy to install. Great look but would prefer that the spray function stayed on instead of having to hold down the button for spray. "The black aerator piece fell out of the faucet head. It's a black piece with a spring in the middle. I've tried putting the piece back on but it keeps falling out. Any suggestions on how to re-connect this piece?" "Does this come in polished brass? When I select polished brass, it still shows the chrome looking one?" "I see in a customer photo that the button is installed on the back of the sprayer. Is it supposed to be reversible like this? Is it easy to do?" The ~2" nozzle where the sprayer button is housed rotates. It can be turned to the front or the back, but doesn't 'lock-into' the position, so it could find its way back to the front pretty easily. We've had two of these faucets for a year or so and have enjoyed them...My only wish would be that the spray button could be secured so it would stay on the spray setting rather than having to push/hold the button for the duration of each use. The sprayer is on something like a bearing and easily spins in a circle. So you can change the spot where the button is at will. When you pull the sprayer hose out you can direct it in any direction and it doesn't matter where you place the button side of the sprayer when it retracts. "Does the Quick Dock top installation work without the base plate for single hole installation on granite?" Yes, it can be done and looks even better (more sleek) without the dock. Yes it can be done and looks more sleek without the dock. "Just want to confirm that the deck plate is included and it's the same finish as the option chosen." Yes; It came with a deck plate of the same finish. I did not use the deck plate as my replacement mounted direct to the granite counter and looks great. I actually called Kraus to ask if I did not need to use the deck plate and they explained that I could go either way. They are GREAT! I love this and my other Kraus faucets. Yes it is and does, I preferred the look without it and chose not to use it, it works just fine without. "There are different types of sprays. Can it lock it on either the "stream" or the "rain", or do I have to keep the button pressed in?" "Is the hose for this faucet stainless steel or fabric?" The hose is black braided nylon.